Natural eco-friendly eco-compatible plaster with high-dehumidifying capacity, formulated with pure natural hydraulic lime, cork, clay and diathomeic powders. To be used for dehumidification and restoration of walls affected by rising damp. 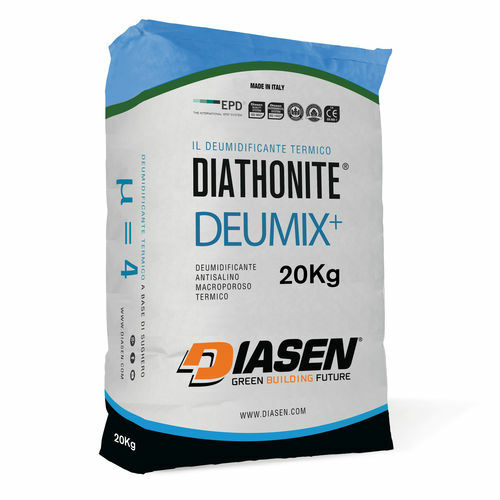 Diathonite Deumix is a completely natural, as it has no concrete, dehumidifying plaster made with pure natural hydraulic lime NHL 5, cork, clay and diathomeic powders. Diathonite Deumix is used for interventions of dehumidification and moisture drainage of all walls affected by capillary rising damp. In addition to the high dehumidifying capacities, this product is characterized by the excellent thermal insulation capacity that allows to limit the formation of interstitial condensation and thus the amount of moisture to drain.